Dheeraj Dhoopar and Shraddha Arya’s Kundali Bhagya was the top show with 6.4 million impressions viewership. It was followed by Sony SAB’s Taarak Mehta Ka Ooltah Chashmah at 6.2 million impressions viewership. The tragic demise of Sridevi left the nation in mourning. 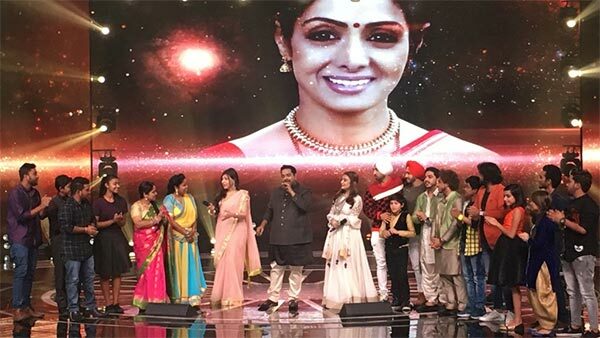 Rising Star 2 paid a tribute to Sridevi through a special episode. It got a viewership of 6.1 million impressions. It was followed by Super Dancer 2, Kumkum Bhagya and Yeh Hai Mohabbatein. Divyanka Tripathi and Karan Patel’s show held on to its spot with 5.5 million impressions viewership. Shakti – Astitva Ke Ehsaas Ki got a viewership of 5.1 million impressions viewership followed by Udaan. Yeh Rishta Kya Kehlata Hai and Ishq Main Marjawan completed the top 10. The No.1 show in the country was Zee Anmol’s Kumkum Bhagya with 10.8 million impressions viewership. It was followed by Zee TV’s Kundali Bhagya at 10.4 million impressions and Zee TV’s Kumkum Bhagya at 9.8 million impressions. Nimki Mukhiya, Sony Pal CID and Super Dancer 2 took the fourth, fifth and sixth place. Star Bharat’s Kya Haal Mr Paanchaal was on the seventh spot with 9 million impressions viewership. Sony SAB’s Taarak Mehta Ka Ooltah Chashmah was on 8.3 million impressions followed by Sony PAL’s TMKOC. Colors’ Rising Star 2 Tribute to Sridevi was on the tenth spot with 8.1 million impressions viewership. Colors, Zee TV, Star Bharat, Sony Entertainment Television and Sony SAB were the top five channels. In Rural, it was Zee Anmol, Star Bharat and Sony PAL.